Here's another find from my local Half-Price Books bargain bin. 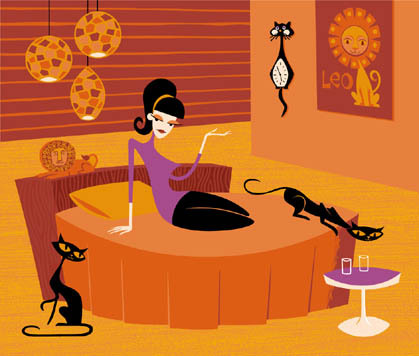 Esquivel is the epitome of space-age pop! If you listen closely to some of the songs on this album, you can imagine watching a classic sci-fi movie or even an episode of classic "Star Trek". "Harlem Nocturne" is the best example of space-age pop on this album, in my opinion (but then, it's been a favorite song of mine for many years). Unfortunately, this record is really worn and scratched up, and, despite my running it through click-removal and noise-removal several times, there's still quite a bit of noise and clicks and pops (and a couple of the songs have skips). 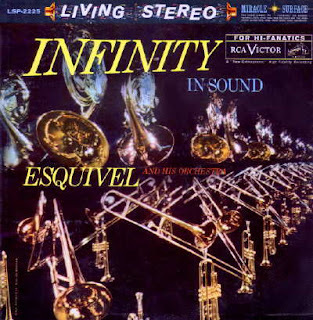 But, I did a search for this album on other blogs and didn't come across it, so I decided to go ahead and post it (despite the bad condition) for those Esquivel fans out there who don't have this album and want it regardless of the condition. Hopefully, someone out there will post a cleaner version of it at some time. Personally, I like the "vintage" sound of some of the albums shared on these sites, so the clicks, pops, noise, and skips don't bother me that much. If you don't mind these imperfections, then you've come to the right place! Oh, and thanks to Ernie, of Ernie (Not Bert), for his tips on recording and preparing records for digital sharing! Well, yesterday, my friend, Bradley, and I made a much needed trip to Half-Price Books to look for vinyl treasures. I came away with thirteen albums, and one was a double-album, so I got fourteen records in all! And all from the dollar bin! Plus I had a 15% off coupon - what a deal! One of the albums I got is today's share. 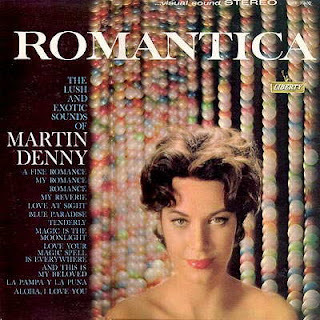 This album presents "the lush and exotic sounds of Martin Denny" - and lush and exotic they are! There are some great standards, as well as some Denny originals, on this record, and they are all lushly romantic. As I listened to this record, I could imagine myself being whisked away to a beautiful island paradise (Hawaii, of course - where I hope to live some day) - sigh! I never get tired of listening to Martin Denny. He is indeed one of the true masters of exotica! Now, remember - as always, I clean up these recordings the best that I can, but due to the age and the way they were stored by their previous owners, a lot of them aren't in pristine condition. But, that just adds character to them, in my opinion! Anyway, I hope you like this one! Put on your dancing shoes and get ready to cha cha cha and mambo! This is a great dance record! It's the kind of music we would dance to when I took ballroom dance lessons for several years in the 80s and 90s - lots of fun! Even if you don't like to dance, this is a great record to listen to if you like lively Latin music! I don't think I've ever heard any of these songs before, but I do remember that, as a little girl, I knew the rhyme that is sung in "Tin Marin". It was slightly different than what is sung, and I tried to remember it as I was recording this album, but I could only remember the first line. I'll have to ask one of my cousins if they remember it. Oh - the picture of the cover indicates that this is a mono record, but it's actually stereo. Well, go "have a ball" with this record! I've mentioned in the past how much I like Hawaiian music, and I've posted a couple of albums of Hawaiian music. But this one is certainly different because it's Hawaiian music played Dixieland style! As I listened to this I could certainly imagine watching the old "Lawrence Welk Show" - it's just the kind of music you'd hear on the show. All but one of the tracks are played as medleys, so there are a total of 37 songs that are played on this album - some are quite familiar, and some not so familiar. All in all, if you are a fan of banjo music or Hawaiian music, this one's for you. Here's an album made, frankly, to celebrate the move of the Steve Allen Show to Monday Night!! It was also produced, of course, with the idea of providing a package of mighty pleasant music, but that goes without saying. In any event, the twelve selections in this collection add up to a typically pleasant session with the Allen piano and orchestra and that's good news any night of the week. As his fans know by now, Steve has the Plymouth people to thank for making the move out of the Sunday TV scramble possible, and for that all TV-lovers as well as music-lovers can certainly be thankful. But whether the listener drives a Plymouth or roller-skates to work, he'll certainly agree that this pretty package of musical evergreens satisfies those who like good music for its own sake as well as those who are always saying to Steve, "We like the comedy on your show but you don't play the piano often enough!" So whether you're listening to these recordings while relaxing in your music room, dancing by the light of your neighborhood jukebox, or driving along in your new record-playing Plymouth, lotsaluck, as Steve says, and happy listening. We guarantee it. I bought this record in pretty bad shape - lots of clicks and pops - and I ran it through the click removal twice, but there's still a lot of clicks and pops. In my opinion, it just adds character to the record. Maybe some of you can clean it up some more. Anyway, it's still a good listen, and I hope you enjoy it. Oh - and if you're interested in learning more about those "record-playing" cars of yesteryear, check out Highway Hi-Fi.